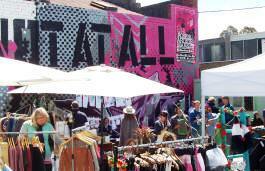 The Rose Street Artists Market is a venue where artists and skilled craftspeople can sell their wares direct to the public. Situated in a yard in bustling Fitzroy and close to Brunswick Street we recommend a visit on a Saturday morning if you are looking for genuine individual hand crafted items rather than the type of hand-made-to-a-repetitive-commercial-formula goods that dominate some of the more high profile craft markets. Enjoy a cup of coffee or a glass of wine or champagne and some food from the cafe and chat with the artists. The venue also plays host to outdoor cinema (called Junkyard Cinema) on Sunday evenings during the summer months.